The Palm Pre smart phone and the company's much-anticipated new operating system--called webOS--are among the most buzzed-about products to come out of CES this year. Despite staging its splashy launch, Palm has been a bit secretive with the device--reminding us of a certain company in Cupertino. But PC World had the chance to sit down with the company and delve into the OS everyone is talking about. And though we had very limited time with the Pre and WebOS, we can tell you what we liked--and what we didn't. The glossy-black Pre has a unique curved slider body: When you slide the 3.1-inch screen up, it curves slightly towards you, a design point intended to resist glare and make the phone feel comfortable in-hand and against face. We only got to hold the phone briefly, but it did feel good in hand and the body felt sturdy enough as we typed on it with the screen extended. The slight angle made it easier to view screen, but we couldn't test the anti-glare claim because our demo room was dimly lit. The slide-out vertical QWERTY keyboard has glossy, tactile keys that are easy enough to type with. The keyboard looks much like that on the Palm Centro; here, the keys are black, with reddish-hued lettering, and separate colors to designate the embedded keypad. The Palm has no touch keyboard, but a third party developer could come out with an app. We do have some complaints about this early unit. The keys are slightly recessed, and the bezel lip on the sides and bottom can interfere with typing. Furthermore, the top row is a few millimeters too close to the top of the slider screen, so we had to angle our fingers in order to press those letters. Palm says that the form factor may be altered slightly before the release date, so we'll be curious to see if our design nits might be addressed by then. The specs on the Pre's camera are a bit disappointing. The 3.0-megapixel camera has an LED flash, but no zoom--a feature that even some mid-range phones carry. The Pre also doesn't have video recording, a feature the iPhone also lacks. But since the OS is open source, a video recording app could be forthcoming. Another big disappointment is the Pre's lack of removable memory: The unit comes fixed at 8GB of storage. But Palm says you can tether the unit to a PC using a USB cable, and transfer files directly from your PC to the phone; it will be recognized as a mass storage device. The Palm has a clean looking home screen with easy-to-identify icons, but we found that their labels didn't exactly pop out, especially when compared with the brightly hued, more distinctly designed icons of the Apple iPhone 3G and T-Mobile G1. Palm did say that the graphical assets were not final, so we could yet see some changes here. 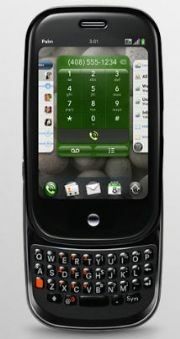 From what we saw, the new webOS is one of the silkiest and best-designed smart phone platforms we've seen in a while. Clearly, this phone operating system will give iPhone and Google Android some competition when it comes to phone usability and overall appeal. The Pre's capacitive touch screen requires just a handful of primary gestures, including scroll, page, and a half-swipe to go back. It supports the increasingly familiar gestures of slides and glides, and pinch and zoom accomplish the sorts of tasks we've come to expect in touch-based phones. You can navigate within apps and among them by using the touch-sensitive gesture area below the 3.1-inch capactive touchscreen. This gesture area replaces Palm's previous dedicated navigation buttons and controls. The Pre has only button on its face, a rounded Center button that acts as a home button. Happily, the top of the unit retains Palm's slider switch for turning off the phone's volume and it has a shortcut to jump to airplane mode (something travelers will appreciate). Like Google Android, Palm's webOS can handle full multitasking--something the iPhone can't do. Palm uses what it calls "a deck of cards model" for managing multitasking: You can view each of your open applications at once, shuffle them any way you choose, and then discard the ones you want to close. All of this is done with intuitive gestures that mimic handling a physical deck of cards. Apps remains live, even when minimized into the card view, so changes can continue to happen in real-time, even if you've moved on to another activity. WebOS also has a nifty Notifications app, a small alert that pops up at the bottom of the screen when you have an incoming call, text message or e-mail, but does so without interrupting whatever app you have open. The calendar has color coordination and multiple calendar support. The big news is that you can subscribe to public and specific calendars, like those on Google and Facebook. If you use the Pre to add something to your Google calendar, that info will be synced with that on Google's Calendar Web site. Likewise, the Synergy email interface makes it easy to check and search through multiple e-mail accounts. Select a contact, and webOS will autopopulate an e-mail with that contact's info. Better still: If you have multiple e-mail accounts set up, you can choose which address to send from while within the message. The Messaging application now combines both SMS and instant messaging into a single umbrella. The conversations are threaded (as they are on current Palm OS-based phones), and can represent ongoing conversations with one contact, across multiple systems (ie, you start the conversation via text, and continue via AOL Instant Messenger). The Web browser renders pages beautifully. You can have as many browser windows open as you want (you're only limited by the available memory) and you can still save pages for offline viewing (for example, while in flight)--a huge boon that Palm-OS devices have always had, and competing devices lack. Pre users will have access to Amazon's Mobile Music Store, also seen on Google's Android-based G1. The store makes it easy to download DRM-free tracks directly to the phone. During our demo, the Pre's built-in accelerometer seemed quite responsive, but not overly sensitive. For example, the display doesn't flip until the phone is almost completely horizontal. One of the most frustrating things about the iPhone is that the display will rotate when you don't want it to, especially if you're holding it at a slight angle. Another cool feature on the Pre is its ambient light sensor. If you're in a movie theater or dark environment, and you receive a message or call, the display will show up darker than normal. The Pre will receive updates over-the-air in the background; and all software installation will be done over the air. Palm has already said it expects to have an app store, which will bring it in line with Apple, Blackberry, and Google Android. Overall, from the short time we spent with the Pre, we saw plenty that we liked. The device looks promising--now, the wait for an actual shipping unit begins. Palm says it will ship later this year on the Sprint network.